Safe to say that Ahmadinejad is an outright IDIOT when it comes to American sports and can’t do his own homework. Talk about FAKE SPEWS (sarcasm intended). Just when you thought that Kaepernick’s story couldn’t get more ludicrous…there you go. It has long been part of the Islamic Republic of Iran’s jihad against the United States to try to exploit the divisions in American society, but this is a particularly ridiculous example of this phenomenon. Do you think Ahmadinejad knows the first foggiest thing about American football? Neither do I. And whoever wrote this for him really gave us a whopper with the claim that Kaepernick “is one of the best Quarterbacks in the league.” The San Francisco 49ers were 1-10 with Kaepernick as quarterback in 2016. His only continued claim to fame is his anti-Americanism, which Ahmadinejad is happy to try to use for his own “Death to America” purposes. Colin Kaepernick may not be playing in the NFL but he has one enormous fan in Iran. Kaepernick famously began kneeling for the national anthem in order to protest police brutality and social injustice…. 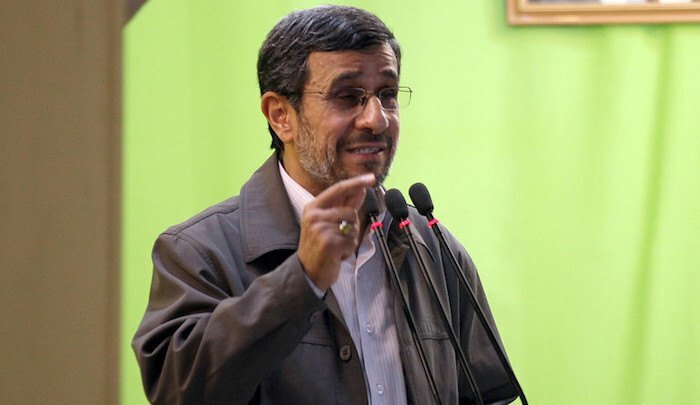 Ahmadinejad has called for the elimination of Israel, denied the Holocaust and called the USA a “Great Satan” along with engaging in nuclear weapon brinksmanship.